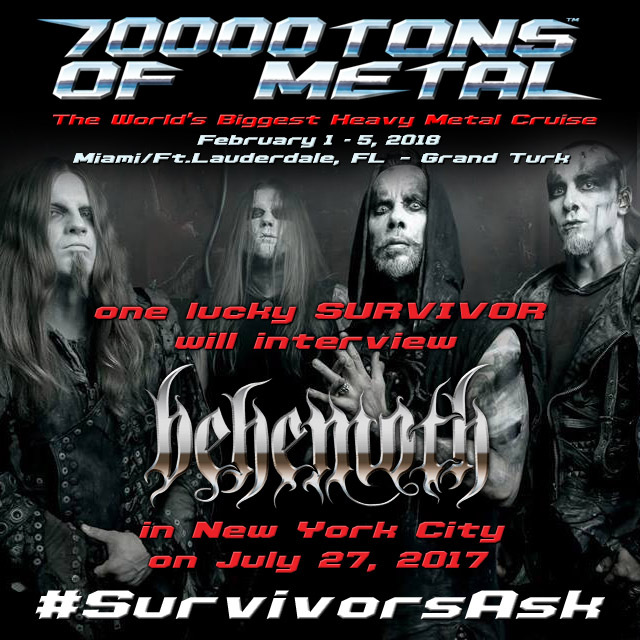 #SurvivorsAsk: Interview BEHEMOTH for 70000TONS.tv! Are you a 70000TONS OF METAL™ Survivor living New York, NY? Would you like to interview BEHEMOTH on July 27 before they play The Theater at Madison Square Garden? Visit the Official 70000TONS OF METAL forum and tell us why YOU would be the best candidate to interview the band – if you are selected, simply get yourself to the show and we will get you plus one friend on the Guest List and organise the rest! If you are not eligible to interview the band, we still want your input… Give us one question you have always wanted to ask BEHEMOTH, and if we pick your question, you will get a shout-out during the interview! ← 8 Months Until Sailing!